There’s an old proverb attributed to the Chinese, “May you live in interesting times.” It’s not a blessing, it’s a curse. Investigative reporter for Vanguard, Christof Putzel, inserts himself into the cranky machine, and teases out the whys and wherefores of this movement that even some of its supporters find hard to pin down. Christof visits Zuccotti Park in Lower Manhattan, New York, where the movement started in grass roots fervor (ironically, in a park with no grass! ); to eat, sleep and mingle in the belly of the beast. He unequivocally gives himself over to living the lifestyle, bedding down in a plastic sleeping bag in the rain next to friendly strangers, using toilets in nearby shops, helping with community chores; asking, chatting, questing for the purpose of the collective and exploring the resolve of individual participants. He attends the meetings, becomes one with the “human mic” (the ingenious method by which crowds repeat speakers’ words to convey their monologues to the farthest listeners without public address systems. “Did he say ‘Blessed are the cheesemakers’?”); Putzel becomes ultimately one of the few reporters qualified to “speak for” the 99 Percent. 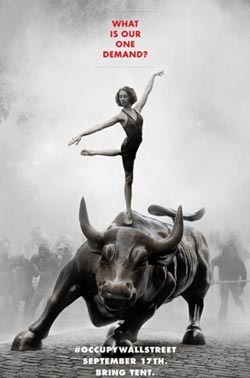 This TV feature identifies the leadup to Occupy Wall Street (OWS); how a magazine called Adbusters, claiming inspiration from the Arab Spring in the Middle East (where protestors ousted dictators through their occupations), called on Americans to organize against corrupt corporations. Their demand: a presidential commission to separate money from politics. One of the many straws that broke the camel’s back for this movement was when the U.S. Supreme Court decreed “personhood” on corporations, and allowed them to donate unlimited dollars to political campaigns, thereby handing the richest people the reins of government policy. Presidency being prostituted much? Another element that drove this movement was more like a coiled spring being turned tighter and tighter: after the 2008 economic collapse due to the nation’s banks and Wall Street engaging in literally criminal practices, not only were they bailed out with taxpayer money, not one of those felons who drove the country to near-depression was jailed. Days turned into weeks turned into months and the economic reform that the Obama administration promised continued to not happen. And the Wall Street scum continued to walk free. Not only that, they openly returned to the same practices that drove the country into the mire. AND – they were giving themselves bonuses with the bailout money – bonuses for doing a BAD job of managing money! Bonuses for doing an ILLEGAL job and not getting caught even though their crimes were in plain sight! It became unconscionable… the seeds of Occupy Wall Street were planted. We can make a reasonable assumption that about 50% of these 99% are not cognizant of their own message. I’m sure the face-tattooed guy who couldn’t pronounce “I feel like I’m making a contribution” is not aware of the message; I’m sure the guy with the placard shouting, “The Jews control Wall Street!” is not aware; the guy with the “I like toast” sign doesn’t know or doesn’t care; and I’d even hazard a guess that many of the Marines and Iraq vets contributing their services to the movement are unaware of why they’re protesting. But – unlike the “Tea Party” mongoloids that were bought out by the Republican party – the Occupiers are at least “good people” (and not in the way rednecks mean it). The ratio of swine to intelligentsia is far lower than it was for any given Tea Party rally. 100% of this 99% comprehend that “something worthwhile” is happening that is good for the community, for society, for the future. But shame on people like Fox prostitute Sean Hannity and dunderhead Bill O’Reilly, who DO know what the movement represents, yet choose to take the idiotboy stance of pretending to believe it’s a rabble of hippies and morons. Same goes for supposedly smart Republicans who should know better, like Krauthammer and Will and Gingrich. Shame on you all for hiding behind your party-before-country, you swine! And the further hypocritical audacity of Republicans to label OWS “socialist” (a dog whistle word which has become – in Republican parlance – synonymous with “alien,” “foreign,” “terrorist”), when the 1% themselves (whom the Republicans stand behind sycophantically) were BAILED OUT by the 99%; money being taken from those with it and GIVEN ARBITRARILY to those without. How much more “SOCIALIST” can their own beastmasters possibly get? A pox on all their houses! 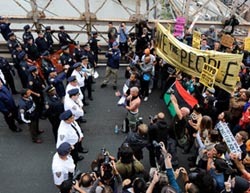 If there was a moment when OWS can be said to have ignited the imagination of the world, tabulators of history point to this date, when an inordinately large number of protestors were arrested by police – 700 – as they tried to march across Brooklyn Bridge. Less than two months after Occupy’s beginnings, now similar protests had sprung up like Hydra heads in many major cities around the country and the world. “The Protestor” is named Person of the Year by TIME Magazine, and the Occupy movement worldwide is put in perspective by detailing the timeline of events around the world that led not just to Occupy, but to the Arab Spring and other protests that moved mountains and governments. It was inevitable that the peaceful protesting of OWS would spawn violence. Because they are protesting against a military industrial machine – a machine that handles conflict in only one way – lashing out. In adopting OWS as the cause célèbre for his nightly news show Countdown, Keith Olbermann covers each instance of police thuggery against OWS in micro detail and with his usual poetic castigation. Though I know Olbermann apprehends the OWS message all too well, his network’s focus on the beatings and pepper sprayings has unintentionally skewed that message or muddied it. 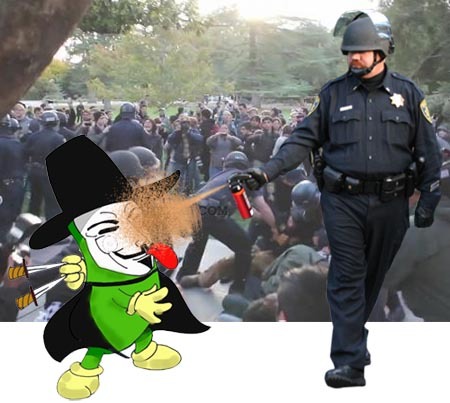 This is truly the agenda of those ordering the pepper spraying and gratuitous brutality – to divert attention away from the OWS message. Other networks have covered the OWS movement, but again, the most coverage we see is when police brutality is the hook. This kind of coverage does injustice to the movement by making the brutality the focus. So even whilst some sympathetic media outlets claim the police attacks are causing the movement to grow (which is true), the attacks per se are succeeding in diverting attention away from the movement’s message. Which means the police are winning; the police, whose departments have been bought off by politicians, who have been bought off by lobbyists, who have been bought off by – you guessed it – the 1%. Which means that no matter the insensitive optics of an 84-year-old lady being pepper sprayed or an Iraq vet having his skull fractured, these images and stories themselves serve to discombobulate the overarching message of OWS – that corporations have bought off the political system in America. Christof outlines some of the short-term positive effects of OWS: some banks dropping unreasonable fees, a customer exodus away from banks (almost like the Great Depression, when people didn’t trust that their bank would be able to give back all their money should they request it – which is as true now as it was in 1933! ); and turning the criminal activities of 2008 into a national conversation. Only time will tell what the long-term effects of OWS will be. Meanwhile, kudos to Vanguard, who dived on this social phenomenon from its infancy. Christof and the other Vanguard reporters consistently deliver top-notch reporting from around the world and THE 99 PERCENT is no exception. Like the 99-percent themselves, Vanguard is speaking up, lending their voice to the struggle by allowing the Occupy movement a platform in their documentary. aka: VANGUARD, SEASON 5, EPISODE 13. Directors: Craig Renaud, Brent Renaud. Air date: December 2011, on Current TV, California. This demand is predicated on the presidency being devoid of corruption, which of course, is patently untrue. Once you attain the post of the highest office in the world, you are too far gone to look back in naiveté. Many people look at Obama and feel that corruption in American politics has, if not been quelled, at least leveled out and stopped escalating daily (as with the W admin). But I’m here to tell you that even though I love the guy for his cool street cred and varied accomplishments that are never touted enough, he is as corrupt as any politician. One word: Guantanamo. Why still open after promising to shut it down? Another word: Bush-Cheney. Why still roaming free touting their war crimes? If the Obama administration shies away from prosecuting felonies that cost millions of lives and trillions of dollars, how dare they enforce laws that incarcerate grocery store robbers for bonking a clerk on the head and stealing fifty-six bucks and change?! Still not sure what the 99-percent stand for? You’re either Republican or a dummy (cough-both). View the 99-Percent website and see the bullet points down the right column. If you’re still not sure, you have a bright future in the American Do-Nothing Congress.